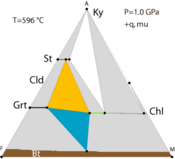 Examples of phase diagrams and reactions in jpg, pdf and animated-pdf format are available. A 5 page summary (Acrobat (PDF) 158kB Aug1 07) of this information is available, which can be used as a class handout. Reactions among solid and fluid phases can be categorized in several different ways, based on what the reaction does, how the reaction progresses, or based on the nature of phases involved. Net-transfer reactions may be terminal reactions or tie-line flip reactions (discussed below). Discontinuous reactions are those that occur at a particular temperature (for a particular pressure). 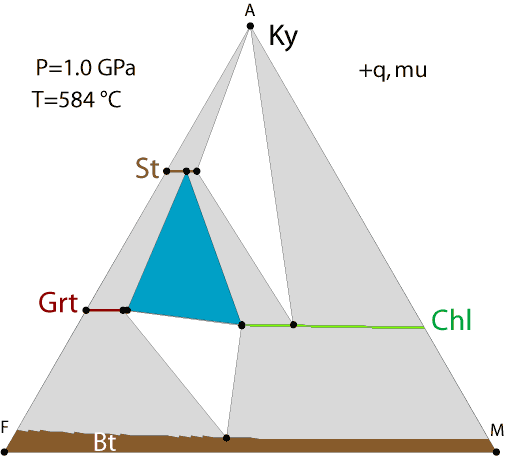 For these, a curve (or line) can be drawn on a pressure-temperature (P-T) diagram. 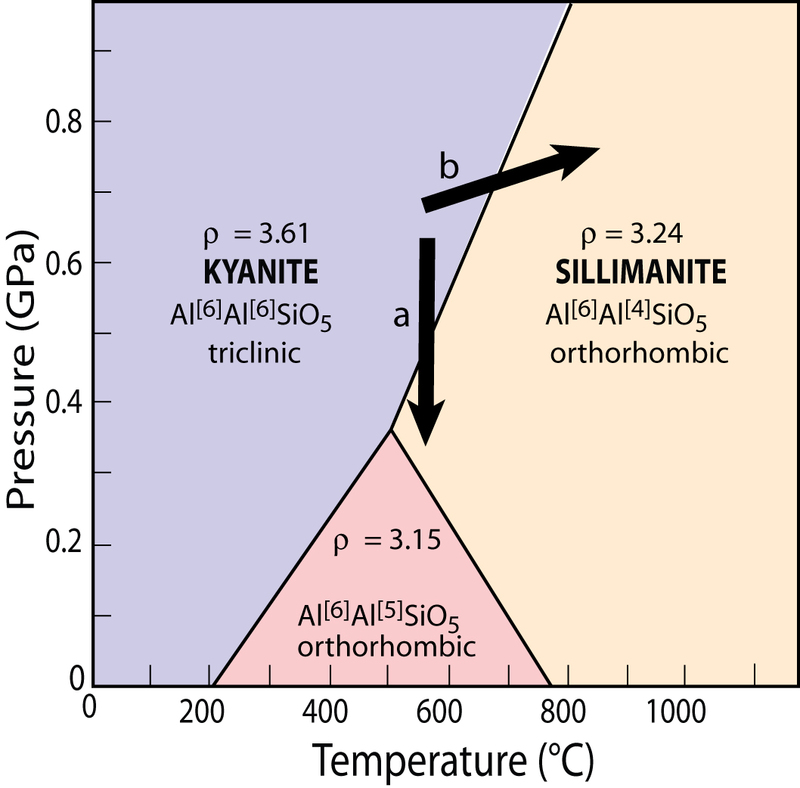 (See the kyanite=sillimanite reaction on the phase diagram shown below.) On either side of the curve, a different set of phases is stable. In a discontinuous reaction, products and reactants can only co-exist stably precisely at the equilibrium reaction conditions (on the reaction line in P-T space). Discontinuous reactions are always net-transfer reactions. Continuous reactions involve phases that may vary in composition. Such reactions are more common than discontinuous reactions because compositional variation, of either fluid or solid phases, is typical for geological materials. Continuous reactions occur over a range of conditions, so the products and reactants coexist stably over a range of conditions (but the compositions of the phases changes systematically as conditions change). Continuous reactions may be net-transfer reactions or exchange reactions. Kyanite inclusions (three tabular grains showing good cleavage and brown-pink interference colors) in andalusite (dark gray interference color, poorly developed cleavage) in a kyanite-andalusite-sillimanite (+ staurolite) quartz vein. This rock was "caught in the act" as kyanite reacted to form andalusite. The photo is from Donna Whitney. This sample is from Hamadan, Iran, and is discussed by Sepahi et al. (2004, J. Metam. Geology 22, 119-134). 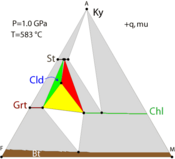 Phase diagram for the Al2SiO5 polymorphs. 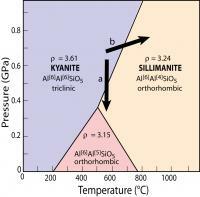 The arrows show that kyanite will react to form sillimanite with increasing temperature or with decreasing pressure. 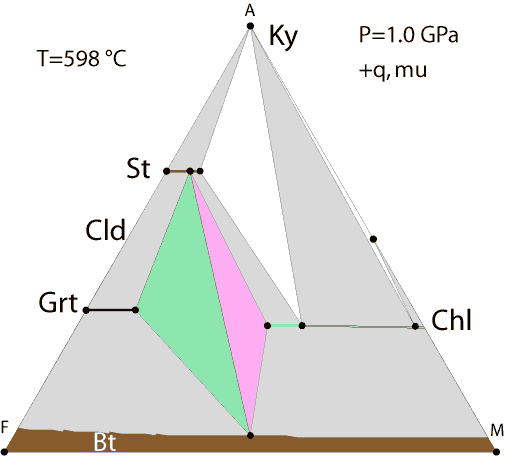 Although not labeled, the pink triangular field at the bottom is the stability field for andalusite. This figure is from Donna Whitney. Solid-solid net transfer reactions (often just called solid-solid reactions) occur among solid phases of differing composition. These phases may include elements found in fluids (H, C), but those elements are conserved in the solid phases so that no fluid phases (H2O, CO2) are involved as reactants or products. Solid-solid net transfer reactions can be continuous or discontinuous, and they may be terminal, or tie-line flip reactions (discussed below). Polymorphic reactions are a special type of solid-solid reaction that involves phases of identical composition. Classic examples are the reactions among the aluminum silicates (kyanite-sillimanite-andalusite; see the photomicrograph and phase diagram shown at right), the conversion of graphite to diamond at high pressure, and calcium carbonate (calcite-aragonite) equilibria. Most solid-solid reactions plot on a P-T diagram as essentially straight lines. 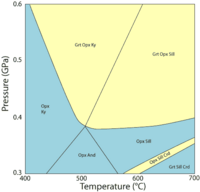 This is because the ΔS and ΔV of reaction do not change much with varying pressure or temperature. 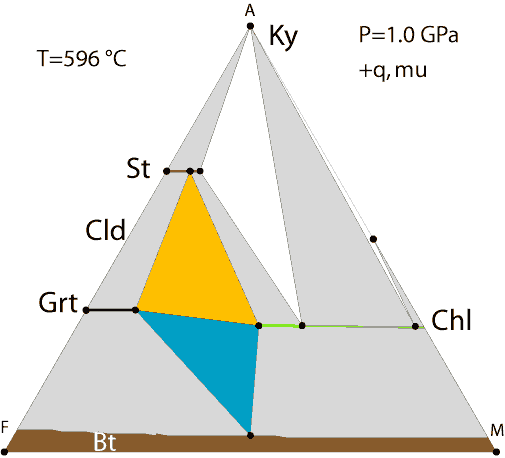 To the extent that ΔS and ΔV do change with P and T, they change about the same amount for both the reactants and the products. 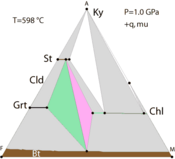 (See the page on the Clapeyron Equation) for more discussion. P-T projection with the position of the Grt-in reaction (curved line between the yellow and blue fields) shown in the FeO-MgO-A2O3 ternary animation. This reaction is shown on the P-T diagram (left) and in the Al2O3-FeO-MgO diagram (right). 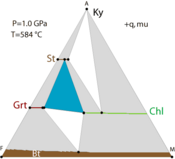 The P-T diagram is a projection -- garnet and orthopyroxene compositions change along the reaction curve. 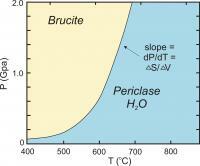 P-T diagram showing the (dehydration) reaction of brucite to periclase + H2O. Figure from D. Perkins. Because the entropy of a fluid is generally greater than the entropy of solid phases, fluids appear on the high-temperature side of most such reactions. If the fluid composition is fixed (stays constant), then devolatilization reactions are discontinuous, but if the fluid composition can vary as a result of the liberation of H2O or CO2, then the reactions will be continuous. Curvature: The curves for dehydration or decarbonation reactions on a P-T diagram will have shallow slopes at low pressure because the volume of a fluid phase is much larger than that of solid phases. However, the compressibility of a fluid leads to a rapid decrease in volume as pressure rises, so the slopes steepen with rising pressure, leading to substantial curvature. 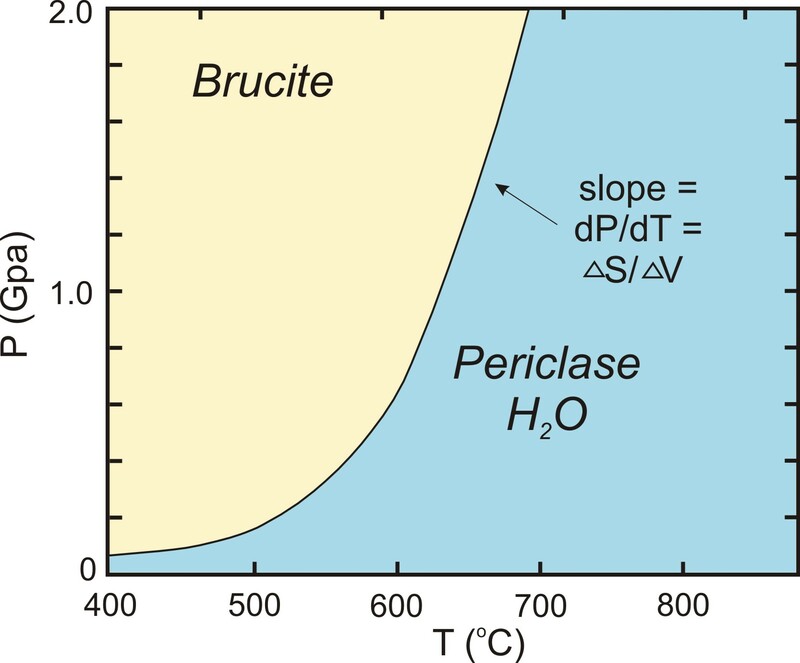 Some (rare) reactions curve around and gain a negative slope at high pressure. if the rock contains an H2O-rich fluid, the right-hand side of the reaction will be stable over a smaller range of conditions than if the rock contains an H2O-poor fluid (either because the fluid is diluted with CO2, or the rock is ''dried out'' and not fluid saturated). 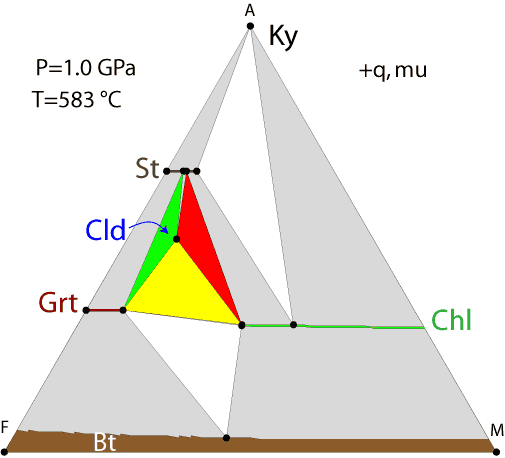 At lower temperature (583°), chloritoid is stable for compositions that fall within the red, green and yellow 3-phase fields. 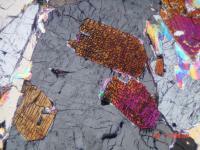 At higher temperature (584°), staurolite, garnet and chlorite are stable together and chloritoid is gone. So, the reaction takes place between 583° and 584° at 1 GPa. Ion-exchange reactions (generally just called "exchange reactions") involve two phases that both share a solid solution exchange such as Na↔K or Fe+2↔Mg such as garnet, (Fe,Mg)3Al2(SiO4)3 and biotite, K(Fe,Mg)3(Si3Al)O10(OH)2 (both formulas are simplified). Reactions of this type are all continuous, and differ from the others kinds of reactions discussed above in that there is no real product or a reactant. Instead, across the complete range of conditions over which the two minerals are stable, both are changing in composition. Curves for these reactions are straight on a P-T diagram (but can only be plotted for specific compositions) and very steep (because there is essentially no change in volume associated with the reaction. Fe3Al2(SiO4)3 + KMg3(Si3Al)O10(OH)2↔Mg3Al2(SiO4)3 + KFe3(Si3Al)O10(OH)2. Thermodynamic Calculation of Mineral Reactions I Lab (Microsoft Word 54kB Mar29 07) - This one week Excel-based exercise, provided by Dave Pattison at the University of Calgary, includes problems sets including the calculation of thermodynamic equilibria involving pure phases.